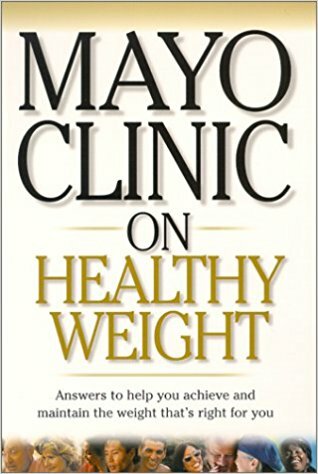 This is a review of the Mayo Clinic on Healthy Weight by Donald Hensrud. This book is absolutely awesome! It talks about how if you go on a diet, then that implies that at some time you will be going off of it. In order to maintain a healthy weight, you would need to keep to the same pattern of eating and exercise. It talks about the difference between exercise like going jogging or to the gym and activity like mowing the lawn and taking stairs instead of elevators. The book will help you calculate your BMI (Body Mass Index) to figure out if you are overweight and by how much. Then based on that how many calories you should take in a day. It has a brief chapter on weight loss programs like Weight Watchers, Atkins, TOPS and also talks about fad diets like the Grapefruit diet and the Cabbage Soup diet. It has a chapter on weight loss medications and one on weight loss surgeries. There is no Mayo Clinic Diet, it’s just eating healthily and keeping fit for your entire life without deprivation or unrealistic goals. I highly recommend this book to everyone who is looking to lose weight, maintain weight or just eat healthier. It’s awesome!.